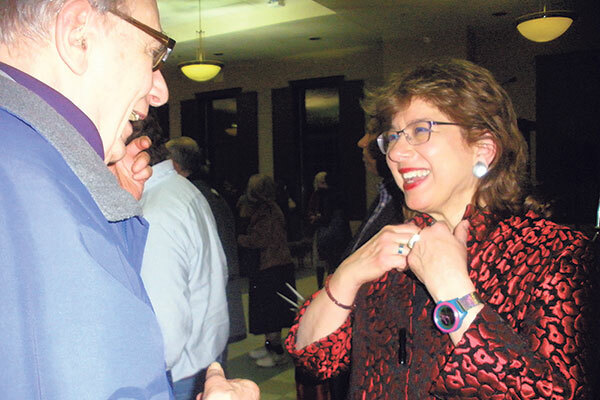 Dr. Susannah Heschel said Jewish scholars’ admiration for Islam enhanced their own connection to Judaism. At a time when both Jews and Muslims faced discrimination in Christian dominated Europe, Jewish scholars sought to improve the image of Judaism by focusing on the nascent field of Islamic studies. 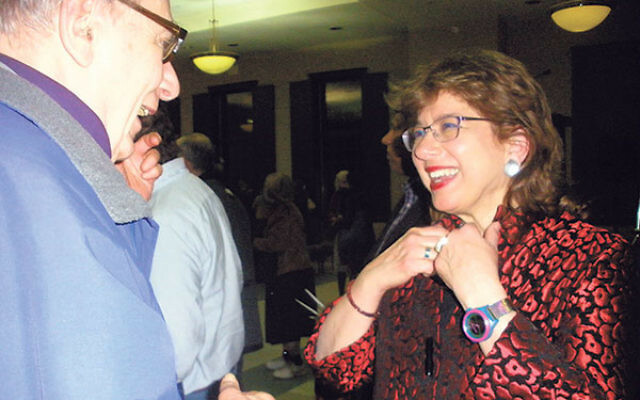 These scholars, many of them Orthodox, produced critically acclaimed works from the 1830s to the 1930s and, in the process, found they often deepened their own connection to and understanding of their own religion, said Dr. Susannah Heschel. Her talk, the annual Toby and Herbert Stolzer Endowed Program, was given March 28 at the Douglass College Student Center in New Brunswick; it was sponsored by Rutgers University’s Allen and Joan Bildner Center for the Study of Jewish Life and cosponsored by the university’s Center for Middle Eastern Studies and Institute for Women’s Leadership. Heschel is the Eli Black Professor of Jewish Studies at Dartmouth University. She told the crowd of 250, which included a number of Muslims, that an era of Jewish-Islamic study and cooperation ended with the rise of Nazism. At a time when Christian Europe downplayed Islam “as a phenomenon that at best unified the Arabs, to Jews it was a religion like Judaism,” said Heschel. The scholarly work of these Jewish academics in many cases forced Christian colleagues to reevaluate Islam in the context of monotheism. Jewish scholars studied Arabic and often traveled to Muslim countries. Heschel said they found common ground with Islam, recognizing similarities in food requirements and ritual practices and regarding it, much like Judaism, as a “rational” religion and that Islam that was derived from Judaism. Currently a Guggenheim Fellow who has done extensive research into Jewish-Christian relations, Heschel is the daughter of the prominent scholar, theologian, and civil rights leader Rabbi Abraham Joshua Heschel (1907-72). Rabbi Abraham Geiger (1810-74), a founder of Reform Judaism, led the development of Islamic studies during that period. During the 1830s his studies of the Koran, linking it to rabbinic Judaism, were acclaimed throughout Europe. Heschel said while Christian Europe often viewed Mohammed as a “heretic” who misinterpreted the Bible, Geiger disagreed and found the prophet used direct references to the Mishna and other Jewish sources. Gustav Weil, who spent most of 1830-35 traveling through Algeria, Egypt, and the Ottoman Empire, writing for German periodicals, was, said Heschel, one of the most important scholars of Islam of his era,” noting he wrote the first biography of Mohammed based on Islamic sources. “His book comparing the Koran to midrashic text built on the work of Geiger,” she said, prompting Christians to take a closer look at the Koran. Despite his academic credentials and prolific scholarship, Weil was denied a professorship for decades because of his religion. Only after halting his academic endeavors in 1860 in protest did officials make him a full professor at the University of Heidelberg. Heschel also cited Gottlieb Leitner, a Hungarian Jew fluent in Hebrew, Turkish, Arabic, and many European languages whose family moved to Turkey to escape anti-Semitism. He came to London to study and teach around 1858, before going with British colonial forces to India, where he was appointed principal of the Government College at Lahore. Leitner was instrumental in transforming the college into the Oriental University of the Punjab. Heschel said Leitner founded schools and institutions in India, insisting classes be taught in Urdu, the native language he used to write his own History of Islam. Returning to England, he designed and built the country’s first mosque, still in use in Surrey. Ignatz Goldziher was another Hungarian Jew with “a remarkable knowledge of Islam,” publishing many works on the traditions, law, and poetry of the religion in the late 1800s. He too was denied a professorship because he was Jewish, until at the age of 44, he became the first Jew to hold such a post at Budapest University. Against a backdrop of contemporary politics, the Middle East situation, and Islamic radicalism, said Heschel, she laments the loss of such interconnectedness. That feeling was shared by several Muslims in the question period that followed. Aysenur Guc, a freshman philosophy major wearing a hijab, said she attended the lecture because she had taken two courses in Jewish philosophy and had read some of Rabbi Heschel’s work.